I will gift wrap your purchase with eco-friendly kraft paper and raffia ribbon and happily add a gift message for the recipient. Size: 8.75 inches x 5.75 inches with 104 pages of white, acid-free 160 gsm Fabriano mixed media paper, which is perfect for sketching, writing, collage, scrapbooking and more. This unique handmade book celebrates my love for plants and trees and the beautiful green places where they grow -- gardens, farms, meadows, parks and forests. The covers and end pages are made from watercolor paper I ecoprinted with eucalyptus leaves and purple basil leaves. It would make a very special one-of-a-kind gift for Mother’s Day or for a new graduate. Making books is a labor of love and involves many steps. First, I create one-of-a-kind ecoprints by hand picking and artfully arranging locally grown flowers, leaves, seeds and roots on watercolor paper, which I press and steam. The colorful patterns on my book covers and fly leafs are created by the unique combination of natural dyes and pigments released by plant materials. 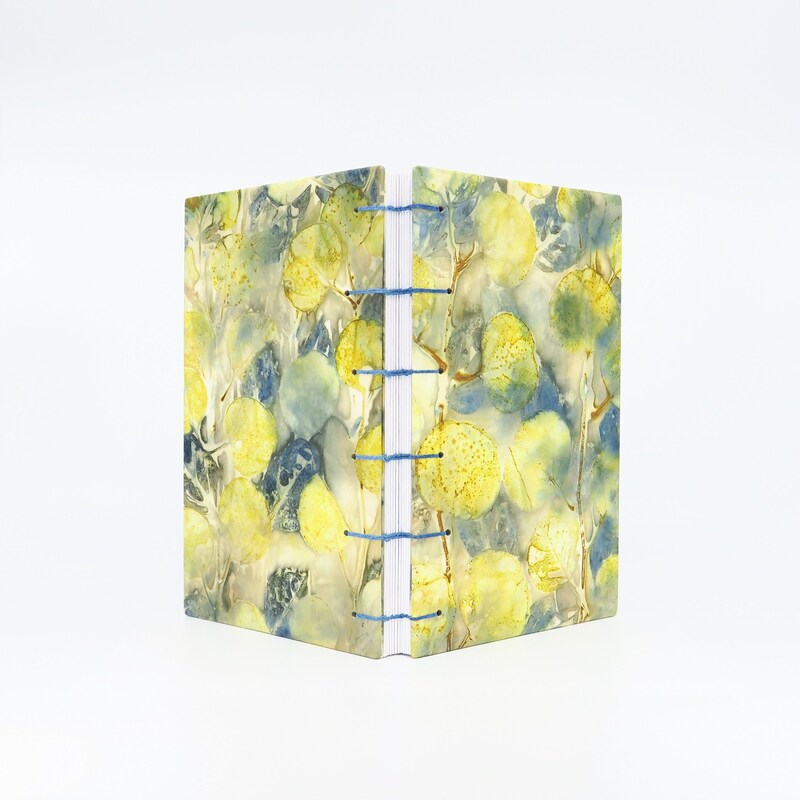 Each journal immortalizes summer's leaves and flowers on its covers and inside pages. I choose the very best ecoprints for the covers and end pages of my books. I treat the ecoprints I use for the covers with a special Japanese starch to make them more durable and also give them a pleasing leather-like feel. Then I carefully fold and glue the covers of my hardcover journals using high quality acid-free book board. I bind each journal by hand using waxed linen thread. The Coptic stitch binding creates beautiful exposed braids on the spine and allows the pages to lie flat when the book is open. I hope someone will enjoy using this book as much as I enjoyed making it. Beautiful journal. Thank you so much. Beautiful journal!!! I love the soft blue pages on the inside. Arrived very quickly. No issues. Thank you. What a beautiful journal. The eco-dyed covers are gorgeous and the coptic stitching is neat and tight. I love that this kind of book lays flat on every page. I can't wait to fill it with ideas, art and thoughts. Thank you. If you would like to order a customized book, please contact me.